I first learned about LinkedIn in 2008 when I was 18 years old. Back then, the school organized an interview workshop for us. The instructor told us that this social media tool was important for young adults like us. So, I set up my account. For the first few years of being a LinkedIn user, I didn’t quite understand how to use it. I basically just pasted my resume, connected with people here and there and checked it sporadically. I even closed it down at one point because I thought it was totally unimportant and wanted to spend more time on Quora. All of these changed when I graduated from university in 2014. I attended this webinar titled “The 3 Steps to LinkedIn Mastery” by the famous Alex Pirouz. During which, he shared about how he utilized LinkedIn to grow his business. I learned through his webinar that LinkedIn could be used for my business development role and relied on it heavily to create organizational charts of firms that I was targeting, account plans and finding key decision makers. When my network grew, I started getting emails from recruiters regularly. At the same time, another colleague from my previous firm was approached by a recruiter on LinkedIn, changed his job and got more than a 2x salary increase. This was when I realized that LinkedIn could be used to help me in my career growth. Sadly, many young adults today aren’t using LinkedIn to her full potential. A lot of them just set up an account and paste their resume there because their school required them to. Even though our instructors recommend LinkedIn, most of the time they have been in a school environment for such a long time that they’re unaware of market realities. Hence, you end up seeing students with accounts that have titles like “Hardworking, ambitious, dynamic and dedicated year 2 student at Nanyang Business School”. The modern day job market is one whereby everyone is their own business. We sell our services to companies. If companies find someone cheaper to do the same job, people get retrenched. If another company offers better salaries/benefits/opportunities, people move. When you’re selling your services, you also need “marketing” and that is where the whole concept of personal branding comes in. LinkedIn is a big part of it. Seeing that many are missing out on a great opportunity, I decided to write this entry to share the benefits of using LinkedIn with my readers. 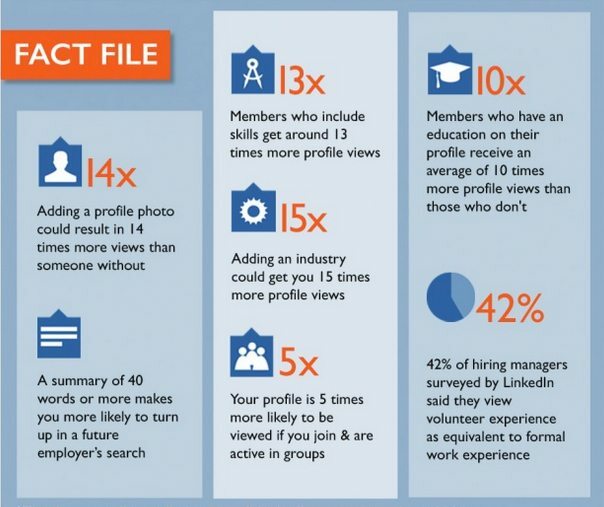 Research has shown that 87 percent of recruiters are using LinkedIn to source for candidates. However, many Singaporeans are not as active on LinkedIn and do not have a completed or updated profile. They are missing out on potential opportunities to switch jobs for a better pay and move up to a higher position. Rather than passively waiting for recruiters to add you, one could be proactive and reach out to them directly. There are quite a lot of shady recruitment firms out there so be sure to engage with the right ones. For instance, if you’re in the accounting industry, then it is good to add recruiters from Robert Half. Or, if you’re from the oil and gas industry, then look for recruiters in Spencer Ogden. Even if you’re not actively looking for a job, some experts recommend that you should still go for an interview. The benefits are aplenty – practice your job interview skills; improve your knowledge about the job market in your industry; know how much people are willing to pay for you and stay on top of opportunities available. *Of course, you have to make sure that you’re invested in the process; keen to learn more about the company and would consider the job if it meets your requirements. If you are not sincere, people can tell and it is not good for your professional reputation. Using LinkedIn regularly and being more active will help you to expand your network. The broader your network, the higher you would rank in other’s search results. I guess this is an area that guys tend to do better in than women. Studies have shown that women dominate all social media channels except LinkedIn. While a greater percentage of women use Facebook, Tumblr, Pinterest, Instagram and Twitter, a larger percentage of men tend to use LinkedIn. Tip: Recruiters sometimes search by company names so if you’re in a company that is one of the leading players in the industry, it helps. Another good point about LinkedIn is that it enables you to view other people’s career history and how they managed to get to where they are today. I enjoy connecting with seniors and successful people in my industry who I aspire to be like. Once I’ve done so, I would analyze their career history to pick out important skills and qualities which I have to master to get to their level. Another useful information I can get is how long can people expect to stay in a certain role before they move up to the next. By reading their profiles, I can also improve my knowledge of the industry as I get to learn more about new companies and roles which they used to do that I might not be aware of. This expands the possibilities of the different paths which I can take in my career. Having access to their profile also helps me to improve my resume writing skills. For instance, I could learn more about how to phrase certain skills or experiences in a more marketable way. Or, how to quantify certain achievements. Besides older people, I also keep track of my peers. I am quite a competitive person so when I see someone doing better, it gives me the motivation to want to improve what I have and catch up with them. In my business development role, I use LinkedIn to understand more about my prospects. However, when it comes to my own career, I use it to qualify the company I am interviewing with. Your prospective colleagues’ profiles can tell you many things about the culture of the firm you’re interviewing at. For instance, how tech savvy are they? What is the gender / racial balance like at upper management? Are they committed to a Singaporean core or is the company dominated by a certain nationality that hires and promotes their own kind? You can even tell how selective the firm is and how hard the interview might be based on the skills, qualifications and professional backgrounds of the people working there currently. Most employers google their prospective candidates to better understand them. The good thing about social media channels is that they rank highly on search engines. For instance, if you search “General Electric” in Google, the company’s Instagram and Pinterest profiles appeared as the 5th and 6th listings, respectively, and Twitter was the 8th result. By improving your LinkedIn profile, keeping it up to date and as impressive as possible, it helps to give a good impression to future employers whe they search for you in the future. Over the past few years, LinkedIn’s features have improved and now you can share presentation decks, photos, links etc on your profile. This helps you to create a more visual representation of what you do. Why is multimedia important? Well, approximately 90% of what we process is visual—and we process visual info 60,000 times more quickly than text. For instance, in my recent role at Euromonitor International, in addition to job descriptions, I’ve also included samples of my slide design and referrals on my LinkedIn profile. This helps employers to get a better idea of my role for instance how my clients feel about me or showcase my deck design skills. 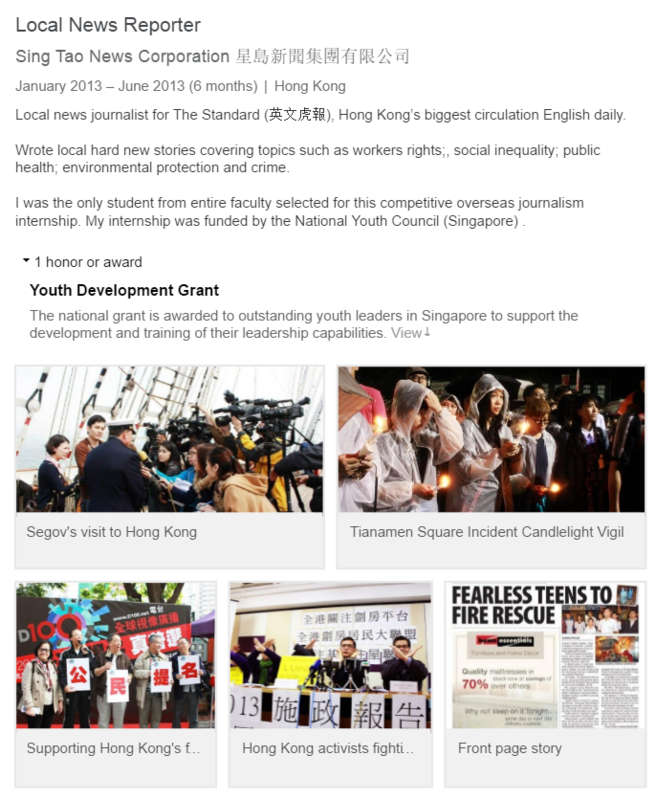 I did the same for my profile section on my journalism internship in Hong Kong. Of course, I don’t plan to change everybody’s minds about the amazing benefits of LinkedIn through this post. Perhaps, what I’ve written might only be relevant for some industries and roles, but less relevant for others. Well, I am just going to answer these type of comments in advance: You can choose not to adapt to technological disruptions in the recruitment space but you would be the one who loses out in the end. Did you enjoy reading this post? Like and share it with you do! How has your experience been with LinkedIn like so far? Share your thoughts with me below! How can Private University Graduates overcome discrimination? How to improve your work-life balance in Singapore? How effective is the Singapore Jobs Bank?